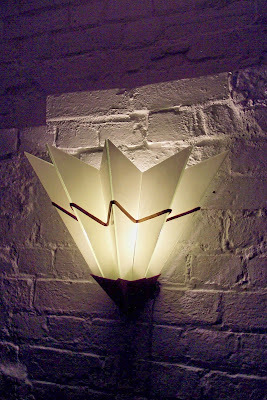 20thCenturycollectables.co.uk: Current stock: 1950s Italian 'deco' style wall lights. Gold and silver painted steel frames with good patination and white glass inserts. Set of 3 available. Width 48cm Length 36cm. Current stock: 1950s Italian 'deco' style wall lights. Gold and silver painted steel frames with good patination and white glass inserts. Set of 3 available. Width 48cm Length 36cm.